This mower will keep working constantly for 7-hours straight. 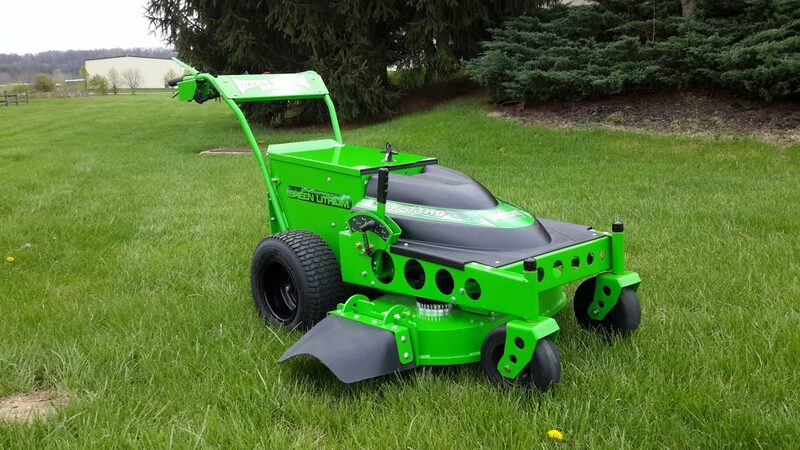 Common to all Mean Green Mowers, you can choose either the high or low blade speed depending on mowing conditions. Moreover, the operator, drive speed dial means you can set the speed of the mower to suit your preferred walking speed. Another common feature is that if you are running low on power, the blades will automatically shut down allowing you to drive the machine back to base. This is an unlikely scenario, however, if you remember to charge up every night. Why punish yourself in the pocket, breathe carcinogenic fumes or put your ears at risk by continuing to use diesel or petrol machines? There is no choking, cranking, warming up or gear changes. No belts or filters to replace. Just a one-click start and you are away. Do you really need the hassle of carting around fuel with you? Do you still want to experience those unavoidable spillages of fuel and oil that are damaging to the environment? The WBX-33 caters for most lawns with seven adjustable height adjustments ranging from 1~4 inches (2.5cm~10.0cm). Expect to pay around $17,000 plus GST for the standard-spec mower with 7-hours of continuous run time. (And don’t forget to subtract three year’s fuel and maintenance savings of around $23,000 so you can compare apples with apples).